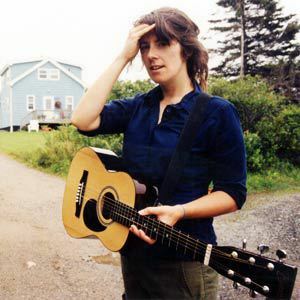 Julie Doiron is a Canadian singer-songwriter of Acadian heritage. Doiron started playing guitar (later switching to bass) in Eric's Trip at age 18, having joined the band under the insistence of her then-boyfriend, Rick White, also of Eric's Trip. Shortly before the band's break-up in 1996, she released a solo album under the name Broken Girl, which followed two previous 7" EPs under that name. All of her subsequent material, however, has been released under her own name. Doiron started playing guitar (later switching to bass) in Eric's Trip at age 18, having joined the band under the insistence of her then-boyfriend, Rick White, also of Eric's Trip. Shortly before the band's break-up in 1996, she released a solo album under the name Broken Girl, which followed two previous 7" EPs under that name. All of her subsequent material, however, has been released under her own name. In 1999, Doiron recorded an album with the Ottawa band Wooden Stars, the first time she had worked with a band since the end of Eric's Trip. She was honoured with a Juno Award for Julie Doiron and The Wooden Stars in March of 2000. She has also appeared as a guest musician on albums by The Tragically Hip, Gordon Downie and Herman D&uuml;ne, and has also released a split record co-credited to the alternative country band Okkervil River. Although most of her solo material has been written and performed in English, she has also released an album of French language material, D?sormais. Apart from her musical career, Doiron is an avid photographer, having published a book of her photographs entitled The Longest Winter with words by Ottawa writer Ian Roy. She often does her own promotional photos and cover artwork along with her husband, painter Jon Claytor.